Absorption elements(filters) are designed to remove water or a specific chemical from fuel, solvents, and oils which is emulsified by the presence of surfactants and will not separate in a coalescer/separator process. These elements are commonly used at refineries, fuel pipe-lines, machine shops, and oil recycling applications. Available in several sizes to fit existing filter vessels, these elements are capable of removing up to 4 quarts of water per element while reducing free water content down below 10 ppm. The filtration layer of the element allows the element to be used in a dual process by removing particulate as well as absorbing water. When configured with our high performance glass media, our elements are able to achieve a filtration efficiency of 99.5% at micron ratings as low as 1 micron.A variation of the standard absorption element is the color change element. 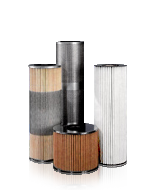 These elements are used in compressed air applications to absorb oil and oil mists in critical applications. Our color change elements use a silica gel desiccant that indicates to the user when the element has reached the end of its filter life by changing colors.